As toddlers in the early 1950's, 3 year-old twins Joseph David Mayer and Michael Leo Mayer played Little Ricky on I Love Lucy where they earned $150 a week for a 26-week season, with 12 weeks guaranteed. They first appeared on I Love Lucy, Season 3 starting in the fall of 1953 and continuing through Season 5 in the spring of 1956. 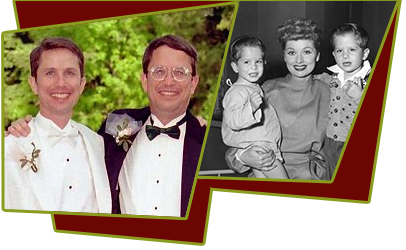 That fall for the new Season 6 in 1956, Keith Thibodeaux starred as Little Ricky. Their mother Eva appeared as an extra in the "Homecoming" episode of I Love Lucy, first broadcast on November 7, 1955. Joseph David Mayer was born in Los Angeles, California, two minutes before his identical twin brother, Michael. The twins' parents, Max Leo and Eva June were active in the Jewish faith until 1956 when they converted to the Church of Jesus Christ of Latter-Day Saints after listening to a message from several missionaries. When producers were looking for a new set of twins to portray Little Ricky growing up as a toddler after the twins who played Little Ricky as an infant, they called upon the Mayer twins after seeing their picture in a local newspaper. Wearing 99-cent Seersucker sun suits, the 18-month-old Mayers beat out kids in tuxedos with agents. Joseph Mayer appeared in the episode where Ricky tells him the Little Red Riding Hood story before bedtime - speaking in Spanish and English. When Mayer didn't cry his parents knew they got the job. Joseph Mayer graduated from Crescenta Valley High School in 1970 and went on to attend California Polytechnic, San Luis Obisbo until 1976. During college Joe took two years off to serve a mission in Tokyo, Japan for the LDS Church. He was first married in 1974 after graduation where he and his family lived in Highland Park, Norco, and La Crescenta, California where he worked at the Times Mirror Press. In the fall of 1979 he moved his family to Oregon City, a suburb southeast of Portland, Oregon. Besides being actively involved in his church, he enjoys Boy Scouts, earned the Eagle Scout award, and has served as scoutmaster several times. He has also served in an Elders' Quorum, has been a counselor in a bishopric, and has been a stake clerk. He also serves as the president of the Jewish Genealogical Society, an organization dedicated to aiding research efforts. He married again in 1995 to Ruth Adel Miller Salway, who along with his 5 children from his first marriage brought an additional 5 children into the family and almost 30 grandchildren. He currently works in computer-related assignments at Portland General Electric. Michael Mayer is a special education teacher at a high school in North Hollywood, California. Besides Joseph and Michael Mayer twins, another set of twins played Little Ricky on I Love Lucy as a baby, Richard and Ronald Lee Simmons, who made their debuts in "No Children Allowed", and were featured for the balance of the 1952-53 season. One other Little Ricky appeared in Season Two as the first Little Ricky as a baby in "Lucy Goes to the Hospital", James John Ganzer.